The event was part of nationwide protests organized in response to recent shakeups in the administration. President Trump on Wednesday demanded Jeff Sessions resign as attorney general and named Matthew Whitaker acting attorney general. 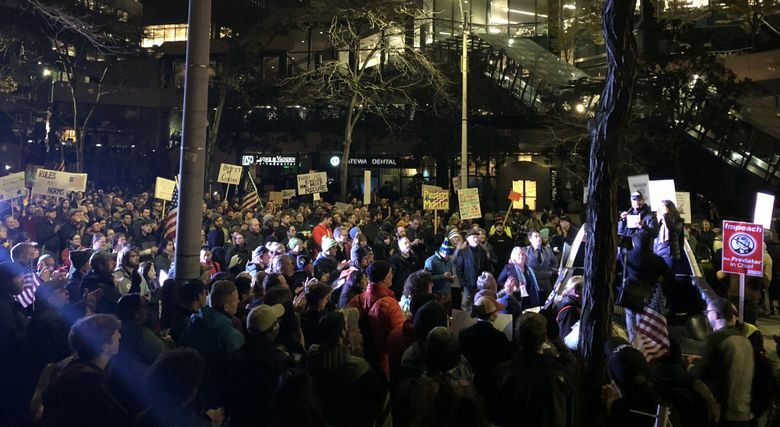 A large crowd marched to downtown Seattle on Thursday evening to call for protecting special counsel Robert Mueller’s investigation into potential coordination between Russia and President Donald Trump’s 2016 campaign. The protesters gathered earlier in the evening at Cal Anderson Park to hear speeches by Gov. Jay Inslee, U.S. Rep. Pramila Jayapal, D-Seattle, and King County Executive Dow Constantine before marching to the Jackson Federal Building. Matt Whitaker: Americans of all backgrounds will resist any attempt to obstruct justice, and you are #NotAboveTheLaw! The march was peaceful as Seattle police bicycle officers rode along with the demonstrators. Drivers and bus passengers faced some delays as protesters took to the streets. The event was part of nationwide protests organized in response to recent shakeups in the administration. Trump on Wednesday requested that Jeff Sessions resign as attorney general and named Matthew Whitaker acting attorney general. Whitaker has publicly spoken about possible ways to slow or obstruct Mueller’s investigation. Sessions had recused himself from overseeing the investigation. Whitaker reportedly does not plan to recuse himself. I’d say more than 1,000 people at #protectmueller protest downtown, which just wrapped up. Seattle Mayor Jenny Durkan was among those who spoke once the group reached the federal building. “Bob Mueller believes in an America run by the rule of law and not a tyrant,” she said. Jeff Miller, a software developer, was among those protesting. He called Trump’s recent actions “a rerun of the ‘Saturday Night Massacre,’ ” a reference to the Oct. 20, 1973 resignations of the attorney general and deputy attorney general after each refused an order by President Richard Nixon to fire Watergate special prosecutor Archibald Cox. “It’s time to do what we can because our elected officials are not doing their job,” Miller said. Co-workers Holly Viola and Geoffrey Fitzpatrick joined the protest after work. “We the people will not stand for this. We still have a say no matter what Donald Trump thinks,” Viola said. “This is still a democracy,” Fitzpatrick added.